Worldwide - Rayne: Shoes for the Stars by Michael Pick. ACC Editions (2015). Pictured above with an old vintage Mamiya C220. Photographed a variety of subjects often Goth themed stuff in cemeteries! Discovered aptitude and interest in Glamour and Hollywood style female portraiture. Became addicted to film noir and it's stylings. Inspired by Gil Elvgren and other retro pin up artists attempted to emulate their pin up styles. Association with Dita Von Teese a natural progression. 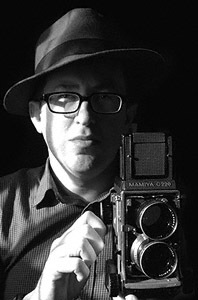 Developed Photography further including documenting several of Dita's burlesque shows as well as much studio and other work.